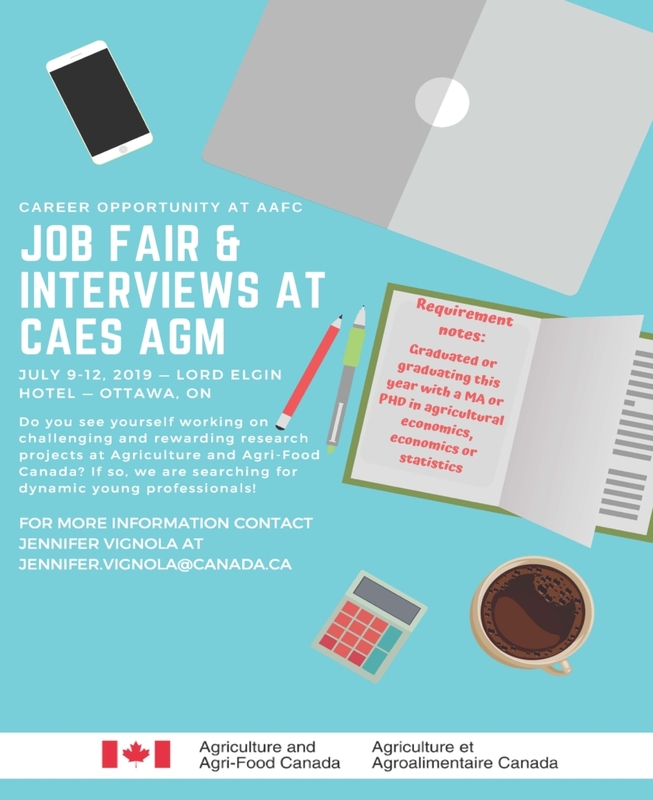 The Canadian Agricultural Economics Society is pleased to announce a job fair for graduate students and potential employers taking place at its 2019 Annual Meeting! What is the value of this opportunity to employers? Organizations will have an opportunity to meet and interview a select group of 15-30 highly skilled potential employees with a graduate level background in economics and knowledge of issues related to food, agriculture, and natural resources and the environment. Information about the candidates will be provided to registered employers who will be welcome to interact with candidates in advance of the Annual Meeting. What is the value of this opportunity to students? 9:00-10:00: Registered graduate students and registered employers check in. 10:00-12:00: Meet and greet over coffee and snacks. This is an opportunity for potential employers and job fair candidates to meet informally and chat over coffee. Potential employers will set up at information booths and meet with job fair candidates as they circulate in the room. 13:00-17:00: Employers interview selected job fair candidates. This period will be dedicated to one-on-one interviews between job fair candidates and participating employers as identified by the potential employers. Further details about the job fair and how to register will be made available in the coming months. Please direct questions to Valerie Johnson, valerie@caes-scae.ca.